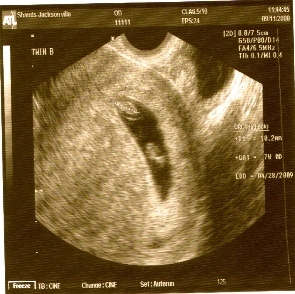 I am now 14 wks this ultrasound was when we found out we were expecting twins. Being much sicker than previous pregnancies, I went to the E.R. for I.V. fluids. My husband and I were shocked and blessed to find 2 babies. We too laughed and cried all at the same time. They looked to be in the same sac but another ultrasound a few weeks later showed a thin line between them (2 sacs). The doc says they could still be identical or fraternal. We are not sure. hello i too found out i was having twins at 7 1/2 weeks into my pregnancy but the doc said that they may not make it due to lack of fetal movement and no heart beat. may i ask you what was told to you on that day of your ultrasound?